Once again, international award winning photographer and author, Salvatore Cincotta has turned to Visual Lure for logo design, branding and website design & development. After numerous successful speaking events and a couple book deals, Sal is entering the photography consulting business with a boom. 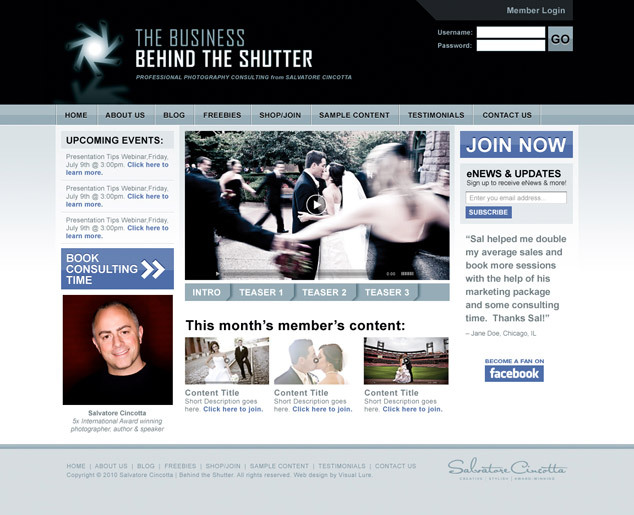 His consulting company is called “The Business Behind the Shutter”, which we assisted in naming. The website will be www.BehindTheShutter.com. We will post a link when the website goes live. Here is a sneak peek at the new website.